Ask fellow campers about "Badgerland Campground" and nearby attractions. Campground is well cared for with lots of grassy areas. Our site was a large pull thru on grass with mature shade trees. Staff is very nice and helpful. There is a swimming pond and a fishing pond on the property. Both looked appealing. The swimming pond has a trampoline in the middle. There is a small bar in the campground open on Thu, Fri & Sat. The bath house was clean but pretty small. Would stay here again though if in the area. We camped at Badgerland Campground in a Travel Trailer. Just passing through so no recommendations. We stayed at eight different camp grounds on our 2 1/2 week trip. This was the most expensive one, but we have stayed here before and really like it. The sites are large and grassy. There is a cute little bar on site. The staff is helpful and friendly, as are the seasonal campers. There is a swimming pond with a trampoline in the middle of it, and a jumping pad on the beach. We didn't have kids with us so didn't use them but they looked fun for kids. It's a very quiet camp ground. We camped at Badgerland Campground in a Travel Trailer. Viking Brew Pub in Stoughton is our must visit stop whenever we stay here. Cute little campground with very friendly staff and seasonal campers. Site was very long and level and nice and grassy along the drive. We stayed in a VIP site (which is their pull-throughs) and ours was an end site. This CG does not have a lot of sites and a bunch are seasonal and very well-kept. The property backs-up to a farm field and is quite lovely at sunset. We heard and saw Sandhill Crane in the area so that was neat. We were here for Father's Day and there were some activities including a pancake breakfast on Sunday morning (free for Dad). There is a little swimming pond in the CG with a floating trampoline which our kids loved. The water is a weird blue color but I'm sure it's a non-toxic algae control measure of some sort. On the Friday evening a strong storm ran through and took us by surprise. We swear it was a microburst as the down draft was intense and totaled our friend's awning while we were standing under it. The next morning we were standing around looking at it trying to see if we could fix it and a seasonal camper came by to help us. He didn't have the right tool so he went off and got the correct one from the owner. Very, very helpful and friendly folks here. We would stay here again. We camped at Badgerland Campground in a Travel Trailer. 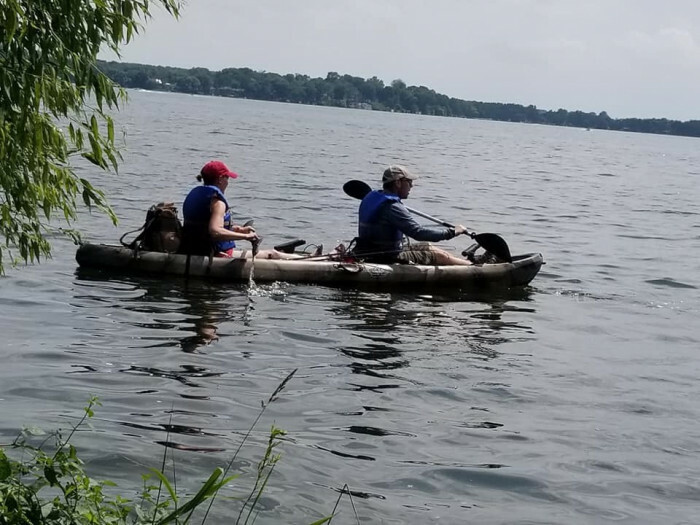 We visited nearby Lake Kegonsa State Park to try out my husband's Father's Day gift--a new 2-person fishing kayak. A cute park, very clean, some hiking trails. The lake is frequented by many boaters and fisherman. The town of Stoughton is quaint, nice little houses, an Aldi and Walmart so many conveniences around. We stayed here Labor Day Weekend. The campground is easily found (only a few miles from the highway). It is a very family oriented place. The other campers as well as all the staff we interacted with were very friendly. The bathrooms ($.25 per three minutes for the showers) were really clean! If you stay in sites around the lake please bring an extra electric cord and hose as the hook-ups are closer to the front of the site as opposed to normally in the back. No sewer connection, but they do have a dump station. It was great fun watching the kids as they laughed, danced, swam, played on the playground and hunted for frogs. The adults brought floats and paddled around on the water as well. Next time I'm bringing floats too! There is a fishing pond across the street which makes for a nice walk around the entire grounds. Also included is a small bar, a nice camp store and lots of activities. 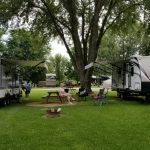 We camped at Badgerland Campground in a Fifth Wheel. Downtown Stoughton is very close by and is a really neat place to walk around and visit their shops, pubs and health food store co-op. The antique shop is great! The campground has been around since 2012. Staff is very nice and accommodating. Prices are reasonable. They have a variety of site types: rustic, 30 amp, 50 amp, VIP (pull-through). Bathroom facilities are always kept clean and well maintained. Swimming pond is spring fed and has a jumping trampoline during the summer months. There is also a fishing pond located on the north side of the road which is a nice feature. There is a small campground store with most of your basic essentials. They also have a small bar in the campground. We have been there for a couple of the event weekends, which were a blast. The event weekends have some activities that work for both adults and kids. I would recommend staying at this campground. We camped at Badgerland Campground in a Fifth Wheel. We had a class A and three tents ... staff was great and we were very pleasantly pleased by how nice this campground was. The kids loved the swimming pond and out sight was grassy with a large shade tree. We camped at Badgerland Campground in a Motorhome. Please don't stay here, it was the worst campground experience our family has ever had. The owner of the campground is so unhappy never a kind word or a smile, he just acts like the customers are a bother and is SO rude. This campground is basically just a flat patch of grass by a farming field. There is no sewer hook up so we had to use the showers, which where filthy and smelt terrible. The campground garbage was full with bags all around the bin that where ripped open and the food was all over the ground, I suspect from an animal. There is a swimming hole on the property, it was too cold but the water was a greenish odd color with garbage in it, definitely, a no go on that. This man is just in the business to make money, does not take care of the campground and is just plain rude. We will not be a back and will not be recommending this place to any of our large community of friends in the camping world On to better camping and happy camping fellow RV'rs!! We camped at Badgerland Campground in a Motorhome. This is our favorite campground!!! We have come here every summer for quite a few years now!! The owner works very hard to keep things maintained and comfortable for his campers!!!! We camped at Badgerland Campground in a Fifth Wheel. There are a lot of restaurants and stores for a campers convenience. This campground has a lot of seasonals but still plenty of spots for overnights. It is very quiet and well maintained. The spots are quite large and grassy with good tree coverage. The bath house is kept very clean. There is a small swimming pond and a playground for children. 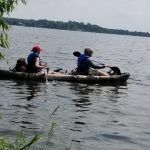 It is very close to Lake Kegonsa State Park and LaFolette County Park. The town of Stoughton is just a few miles and has a lot of neat shops and bars/restaurants. 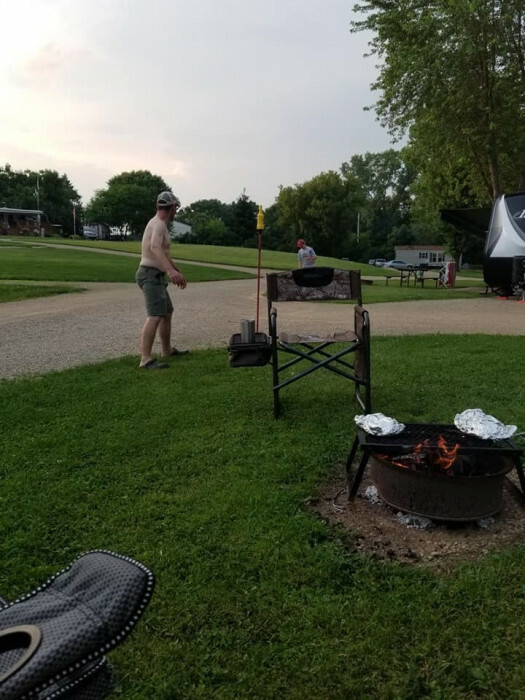 Another nice thing about this campground compared to others in the area is that it does not have a two night minimum on weekends. We stayed here on a Friday night as a halfway point on a long trip. We liked it it so much we stayed here again on the way home. We camped at Badgerland Campground in a Travel Trailer. 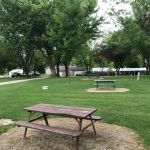 Campground has new owners and has been re-named Badgerlands Campground. Our premium gravel pull-thru site was long enough for our 40 ft motor home and toad and reasonably level. Roads inside the campground are narrow with sharp turns and low-hanging branches that made it difficult to maneuver our motor home. This is an older campground filled mostly with seasonals. Campground is clean and well maintained. Helpful and friendly staff. Plenty of trees, although none blocked our satellite dish that was luck. Good Verizon signal. We chose this campground by chance while traveling on I-90. Nice enough in its own way but not set up for over-nighters and overpriced for what we got. We camped at Badgerland Campground in a Motorhome. 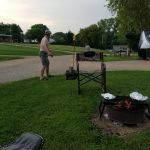 This campground was well located for what we wanted to do in the Greater Madison area: to ride four Rail to Trail bike rides, and so for that reason, not sorry to have stayed here. However, this campground needs some maintenance. We have a large fifth-wheel and needed to maneuver around many low trees that crossed the roadways. There are no sewers, which isn't all that unusual in this area, but the bathrooms were in need of serious help. Showers were not working and the floors in poor repair. It was quiet which I cherish above sewers. We camped at Badgerland Campground in a Fifth Wheel. Mostly permanents or seasonals here. Park is not close to anything (restaurants, attractions). We had a nice wide, long space, others were not so fortunate. Showers were small coffin-type and you had to pay, and could be cleaner. No laundry. Nice shade and we had satellite reception. We camped at Badgerland Campground in a Travel Trailer. This was one of the first campgrounds we stayed at on our way home from our summer trip last year. The main part of the park is much nicer than the part that we stayed in, but we requested to be in the "boondocks" as we have 4 small dogs that travel with us and prefer to be off and away from people for their pleasure and ours. We were given a site that was so out and away that for two days we didn't see a soul! How perfect is that? And we had a stocked lake right out the bedroom window with free paddle boats for you to use. If you have children they also have really nice, wooden swing set gyms located throughout the park. We camped at Badgerland Campground in a Motorhome. Are you affiliated with Badgerland Campground ?